Although I am a fan of quill and paper there are times when even I have to leave the 18th century behind and fire up my computer. 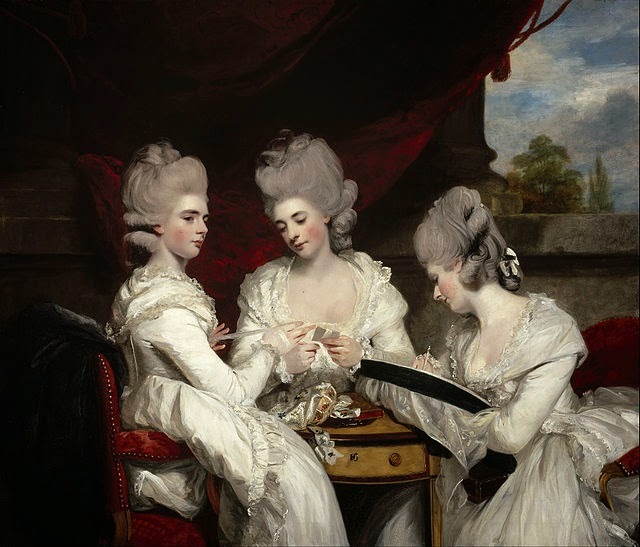 So I don't feel too out of time, I always keep a little slice of Georgian art to hand on the desktop and my current piece is The Ladies Waldegrave, an iconic 1780 painting from my favourite, Sir Joshua Reynolds. The image is simple enough, showing three beautifully presented young ladies pursuing their peaceful, sedate hobbies in a richly appointed setting. There is hardly anything remarkable about the painting with its idealised subjects. Twenty year old Charlotte Maria holds a skein of silk whilst nineteen year old Elizabeth Laura winds the thread carefully and to their right, eighteen year old Anna Horatia is engaged in the exacting pastime of lacemaking. The painting is, in fact, an elaborate shop window fashioned to showcase the appealing trio to possible suitors. It was commissioned by Maria, Duchess of Gloucester and the mother of the girls. She knew that few things could compare to the exposure and compliments this stunning work would garner even though it was actually intended to hang in Strawberry Hill, home of their great uncle, Horace Walpole. The siblings are dressed entirely in virginal white, engaged in sedate pursuits and, in the capable hands of Reynolds, presented as ruddy-cheeked, elegant beauties. Any one of those young ladies might make an ideal wife for a man of breeding and in fact, that's precisely what happened. Thanks, one imagines, in no small part to this remarkable painting, Charlotte married a Duke, Elizabeth bagged an Earl and Anna won an Admiral. One can only imagine that Lady Maria felt it was very much a case of mission accomplished. ...but Why,Madame was it mean't to hang in Strawberry Hill? Obviously Horace had given his approval.Was it because his house was a"show piece"for Society? Precisely sir; it was thought an ideal space to exhibit the work to gentlemen of taste and breeding! Like an 18th century version of Match.com, eh?